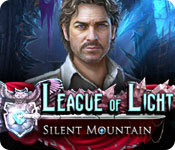 League of Light: Silent Mountain is rated 4.5 out of 5 by 20. Rated 5 out of 5 by PATinPNS from That Mountain Not so Silent! This is posted after playing the entire game. I really enjoyed playing this great game. It was nice and long with thrills at about every curve. 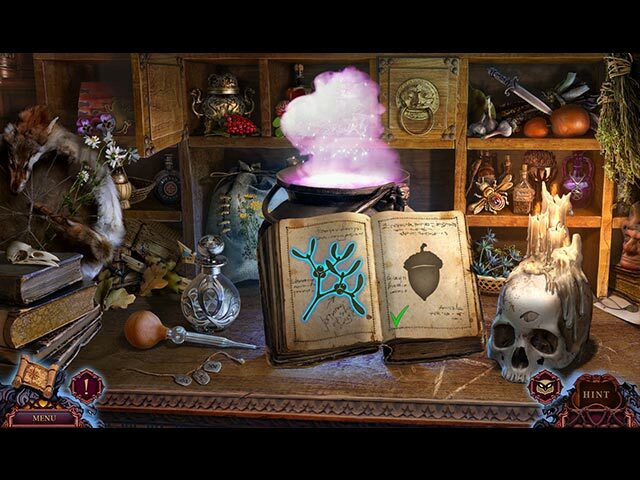 Even though I did tire a bit on a couple of the hidden objects and some of the puzzles, I thoroughly enjoyed myself. The one thing that made this a buy for me, was I got to chose if I was a male or female. Those high heels I have to dig out to play most games hurt my feet. Don't know how you ladies do it... :-) The graphics were awesome! Pretty and not so dark even though they were dealing with a dark subject. Music wasn't bad and went along with the action in the scenes. Voice overs and effects were excellent. Just a well put together game. 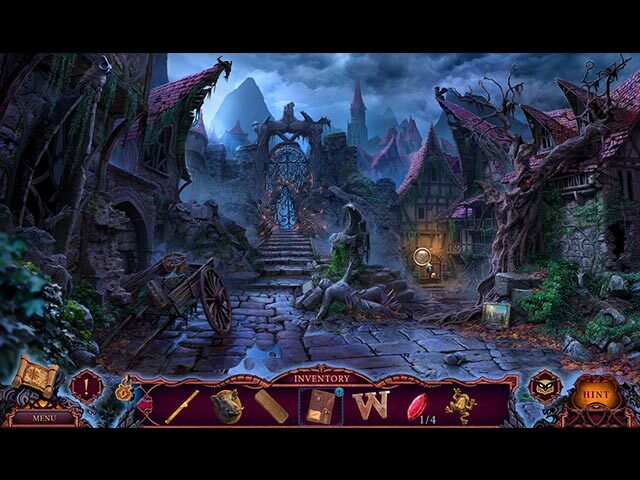 I am tiring somewhat of that shadow hidden objects, but there are so many different things going on in the scenes, they really didn't bother me that much. The mini games... well they were mini games. Most I did do, but some were either too involved or I didn't understand and gave up on them and hit the hint. There is an interactive map which does show actions to be done and transports you. I lived on the map so it is pretty important to me. I won't go into the story. Others have done that an Big Fish does a great job laying the ground work for it. The story is a complete one, easy to follow and gripping. There is an end, but the groundwork for another in the League series must be in the works. I've got a few of this series and I do believe I like this one the best. Give the demo a shot and I think you will be hooked like I was. Rated 5 out of 5 by biscuitsmama from UH OH, SOMEONE'S UP TO NO GOOD League of Light is back with an excellent new game in the series. Given your impressive record for solving mysteries, the League of Light has called upon you and your expertise to track down and return an important artifact that has been stolen from its vault. Not only is the valuable artifact missing, it was stolen by the daughter of the League’s leader. Now you must find the missing agent and return her along with the artifact to league headquarters. The game offers four modes of gameplay: Casual, Experienced, Masterful, and Custom. Thankfully we are offered the custom mode far more often now. Even though there is a custom mode, Casual and the experienced mode do allow you to modify several settings. The graphics are just awesome being extremely crisp and clear. Not only are the graphics top-notch the voiceovers are exceptional. I love artwork and could probably spend all day looking around in each scene because there is so much to see. The only comments about the graphics is that the cutscenes seem to be cartoonish and the other, and yes I know that it is nit-picking, but I don’t think people wore jeans during the game’s apparent time period. Guess it is considered artistic liberty to make the game appeal to a wider audience Your tools include an interactive transporter-type map that is found early in the game. Although we see some cute animals and do rescue at least one of them, we don’t have animal helpers. There is quite a good mix of HOPs in the game including all the favorites, and most of them require quite a bit of interaction to complete the scenes. I happen to like the variety that keeps things far more interesting. The puzzles are wonderful with some of them being very easy but others take quite a bit of thought to figure out. IMHO, the puzzles make the game so much more entertaining. The League of Light series is one of my favorites and, IMHO, they just keep getting better. The team who brings us these games is one of the best and they always give us nice long games with a lot of detail. Although not everyone will agree, I think Silent Mountain is possibly the best game in the series, even though I did love the previous game – Wicked Harvest. If you are looking for a game with great puzzles, fun HOPs and a wonderful storyline you have found it. Even though I have been eagerly waiting for the game to be released and know that it is an instant buy for me, I recommend that you try the demo to see if this is a game you will enjoy. Rated 4 out of 5 by ninja226 from A Thoroughly Enjoyable Journey Through Black Rock Story: you play a detective tasked with finding Louise Gray, daughter of the head of League of Light agents, who has stolen the Stone Gauntlet. Your journey takes you through Black Rock. The story of Black Rock and the Stone Gauntlet is skilfully told through a series of scrolls encountered along your journey. You are given the choice of playing male or female detective with respective male or female narrator voice. Graphics: very good. This is not a grim, sinister or dark HOG--thank goodness. VOs are very good and fit the characters. There is quite a bit of animation for a cinematic feel to the story. Music is completely forgettable, but not intrusive, Level of challenge: easy. HOS and puzzles are not hard. I didn't have to consult the walkthrough once, which is an accomplishment for me. Gameplay: very good, very intuitive. Nice flow to the tasks and objectives to accomplish. This is a thoroughly enjoyable game to play for HO devotees. The plot holds your interest throughout the game, and even semi-plausible for the fantasy/mythic genre. More experienced gamers might find this game too easy, but I did not find the game commonplace. The special effects, VOs, graphics, and gameplay melded well for a fun game experience. I would recommend this game, absolutely. Rated 4 out of 5 by SparkleGlow100 from Rocks of DOOOOOOOOM! A game for anyone. This game stays interesting! The graphics are good and the locations keep changing. There's lots of crumbling, ancient stone buildings to explore. You have 4 sound controls. The MAP is invaluable, because you’ll be all over the place. I liked the puzzles/minigames that kept popping up, and the HOPS are varied. Not big on characters, but the ones that are present are ok. I LIKE that you can choose to hear a male or female voice as the character you play as! In the storyline, just when you think you know what is happening, and it’s all getting a bit predictable, there’s a twist for you! I think the only thing slightly annoying was that you can’t skip to the next piece of dialogue without listening to the whole thing -maybe to prevent kids from missing it perhaps? Rated 4 out of 5 by nextgengranny from Charming Relaxation I should start by saying I don't normally go for SEs, as I've a penchant for my collectibles & bonus play...I got the SE this time because COUPONS! That said, I enjoyed this game enough that I expect to purchase the CE. As w/ other recent MG efforts, it has a lot of visual appeal, & elements I find charming (to illustrate what I mean by "charming", a chessboard on a park bench constitutes charming...a cutesy little creature does not). These 2 factors are probably causing me to rate this game a little high; 3.5 stars would probably suffice. There's a certain fair amount of what could be considered filler; for example, "fragmented finds" which consist of small windows where one finds 5-6 fragments of a pitchfork, sword, or whatnot (I counted 9 of these, & 10 fully-developed HO scenes). The mini-games are proportional in #, & while pleasant enough, represent nothing I haven't seen before, & very little challenge; some can be solved w/ literally 6 or so mouse-clicks. For me, this games provides a few hours of charming relaxation. I don't want that as a steady diet, but when I do, this game will fill the bill nicely. Rated 4 out of 5 by Terry1969 from Loved it From Start To Finish Could not stop playing this game. Graphics were good as usual and the music is spectacular. I played the main story-line in 6 hours and the bonus chapter in 3. I have to stop going through them so quickly as its costing me a small fortune in Big Fish Games. Really, I don't mind though as it passes time in between my housework while I wait for my son to get home from school and my husband to get home from work. A+ for the game, I might just have to play it again just to get the two achievements I missed. Rated 4 out of 5 by pennmom36 from When An Agent's Daughter Steals An Important Artifact From The League Of Light Vault, You Are In Charge Of Returning Them Both Unharmed! Following right on the heels of League of Light: Wicked Harvest, I was worried that this game wouldn't be able to keep up the pace, and it would be a huge disappointment. That's simply not the case, and I have a feeling that the writers of this series are just warming up, in fact I'll venture to say, that this series will continue to thrive and become a much anticipated game just like some of the bigger, well known guys. Your services are required once again. The League of Light needs you to locate and safely return Linda Gray, and the artifact she stole from the League's very own vault! To make matters a little more complicated, Linda just happens to be the daughter of one of the Top Dogs at the League of Light, whose husband disappeared just last month! Tracking down Linda is the easy part, saving her from the Stone Giants is a different ballgame altogether. All you need to defeat these rocky giants, is a tear from a dragon and his heart of course, but I'm not sure which one to collect first, taking a dragon's heart first would surely make him cry at least one tear, right? The League of Light doesn't seem to have any special gadgets like most secret agencies, in fact, you have to travel to Stoneville, Belgium via a Balloon, which barely gets you there in one piece! You may not have special goggles or a rambunctious 4 legged partner, but you do have some pretty good survival skills, especially when it comes to dodging the razor sharp stone shrapnel that gets hurled at you everytime you try to help Louise. There are complex Plus Sign Inventory items that either require you to combine the item with other inventory items or play a small game or puzzle before using that item. The Collector's Edition has the addition of several Achievements to earn, (one of which is unique to this series where you must answer a simple question about the game), League of Light hidden Characters Figurines to find and 26 Hidden Owls (another unique icon in LOL) they are really easy to locate at first but become more difficult to find as you progress because they are very well blended into the scenery. 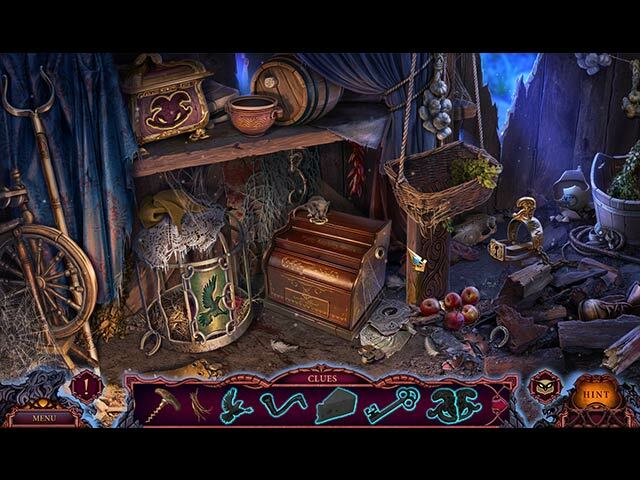 The Hidden Object Puzzles are really entertaining, there are several small HOP's within some of the zoom zones, with a handful of fragments to find as shown in the outline to the right which will give you a useful inventory item when completed such as a pitchfork or sword. The normal HOP's vary back and forth from interactive List finds to progressive, interactive Silhouetted Shape finds where you find the first item that matches the silhouetted shape found and then use that item to interact with other items in the scene to expose the next item and so forth. My favorite HOP was finding items that are blended into a knight's coat of armor. The Mini Games are my favorite part, and this game has a ton of them, some old standards, some new and different. There are the usual games where you slide tokens to their matching slots, slide a hexagon shaped gem around a honeycomb style grid to cover all cells, or set clock hands to the correct time, using clues you find on the clock itself. There are descriptions written on notes that you correctly place onto a map, if it's in the right place, you get to hear some of the tragic stories that happened to the citizens of Stoneville. One of my favorite games had several number tiles with either a forward or backward arrow on them that you placed in slots in the order you want. When you are done, you hit the play button and a man walks a path, step by step with that exact pattern. He may walk 8 spaces forward, 5 steps backward, 3 steps forward etc. so that the last move he makes will put him at the end of the path, if he lands on a step with fire, you have to redo the entire process. The Collector's Edition has18 Concept Art Pictures, 13 Wallpaper settings, 10 Achievements, 6 Music Soundtracks. 26 Hidden Owls, Collectible League of Light Characters, a built in Strategy Guide and a Bonus Chapter, enjoy! Rated 4 out of 5 by kateblue222 from CE or SE? Hard to advise you because information about the Extra Features is not sufficient to make a decision. This review is based upon playing the first chapter of the CE twice because I found I had forgotten it since I bought it, life having intervened. To me, this game is not the immersive experience that a truly great (hence 5 star) game should be, but it is right up there . . . There's a bunch of CE reviews out there that give you great information about the game. I just try to tell you whether you should buy the CE or the SE, that being the information I want to know if I have bought neither and both versions are out. This game has: Clear Artwork that is, maybe not the most beautiful, but fun to look at Sound and Music that lends to the ambience instead of being there for their own sakes. Progressive HOPs that are logical and fun Logic! thus giving a good challenge without stumping you. This game also has some talkiness and occasional short movies that you can’t skip, but no game is perfect . . . The reason I suggest that you might buy the SE instead of dropping the big bucks for the CE is that you don’t know what you are getting. The Extras menu has a button for “Extra Gameplay,” but it doesn’t say what that extra gameplay is, and it is chained up until you finish the main game. So, is it just a bonus chapter, or do I get to play these great puzzles over??? I WANT to play them over!! Silly developers! Tell us what we get when we buy the CE! Don’t make us guess! So, anyway, that’s another reason why only 4 stars. If you want to gamble on what the “Extra Gameplay” is, go for the CE. Otherwise, buy the SE because it is a great game. You will certainly have fun. Rated 2 out of 5 by Granny_Gruff from Let's Leave Louise in the Hole She Dug Herself! You set out on your new assignment and there is a vehicle crash - this time a hot air balloon. (There has GOT to be another way to start an adventure. Five stars to the Dev that figures it out.) You have been sent to recover an artifact that Louise, the daughter of the leader of the League of Light, stole from the vault at headquarters. She ran to Stoneville, a small secretive village in the mountains. You quickly run into strange rock formations, threatening strangers, and stranger circumstances. Good stuff: The artwork is very stony. There are the usual average game elements. The story is a bit different. It has us chasing another agent, who is presumably trying to find her husband, and, in the process, putting us in mortal peril. Bad stuff: Game-play is average and predictable. HOPs and mini-games are ditto. There is endless rain, the sound of which is more varied than the music. I urge you to try this before you purchase it. I will be leaving Louise to her destiny, alone.